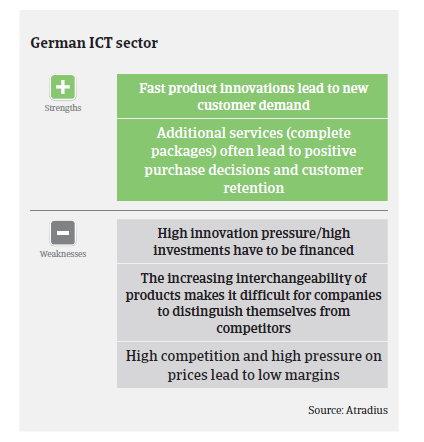 Despite continued sales growth, most German ICT businesses operate on very tight margins due to fierce competition and price erosion in most subsectors. 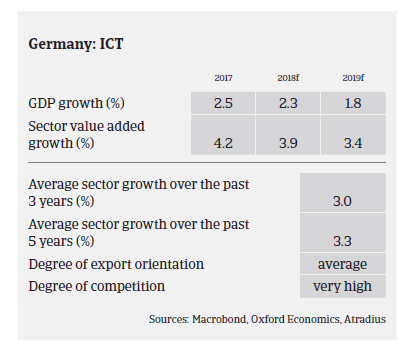 ICT plays a pivotal role in the German economy, employing more than one million people and having generated about 150,000 new jobs over the past five years. The German ICT market is dominated by a few big groups, but characterised by a high number of mid-sized companies. According to the German Federal Association for Information Technology, Telecommunications and New Media (BITKOM), ICT sales increased 2.2% in 2017, to EUR 151.8 billion. This trend is expected to continue in 2018, with a 1.9% growth rate forecast. While turnover in the telecommunications segments is expected to rise only 0.4% this year after levelling off in 2017, IT sales (IT hardware, software and services) are forecast to increase 3.1%. Within this segment, software sales (up 6.3%) are expected to be the main driver of growth as in previous years. Despite continued sales growth, most ICT businesses continue to operate on very tight margins due to fierce competition in all subsectors, while equity strength is below average. Fierce competition and sharp price erosion have led to an ongoing trend of consolidation. Unless they are well-established in niche products, smaller companies are – and will continue to be – the losers in this cut-throat environment. On average, payments in the ICT industry take between 30 and 60 days. Due to the more difficult market conditions (e.g. price wars), payment delays and insolvencies are expected to increase in 2018 (in 2017 ICT business failures increased 1.5%). This is bucking the overall trend, as German business insolvencies decreased 6.6% in 2017 and are forecast to decline further in 2018, by about 6%. Due to fast changing technology in this industry and low margins, the wholesale and retail of electronic appliances segment is especially susceptible to fraud. Several ICT businesses like IT-distributors of tablets and mobile phones have been involved (sometimes inadvertently) in missing trader intra-community (MTIC) fraud cases (i.e. the exploitation of the VAT rules which state that cross-border transactions between EU member states are zero-rated for VAT purposes). We are particularly cautious about this, as even innocent businesses caught up in a so-called “VAT carousel” can be left bearing significant tax liabilities, leading to liquidity issues, “freezing” of accounts by tax authorities as well as the negative effect of losing sales to customers that are cautious of buying from prosecuted suppliers. In general, our underwriting approach for the ICT industry is neutral to cautious due to the issues mentioned above and the fact that credit insurance claims have increased over the last couple of months. As ICT is a very fast and innovative industry with sharp price erosion and high competition, we require comprehensive information (e.g. 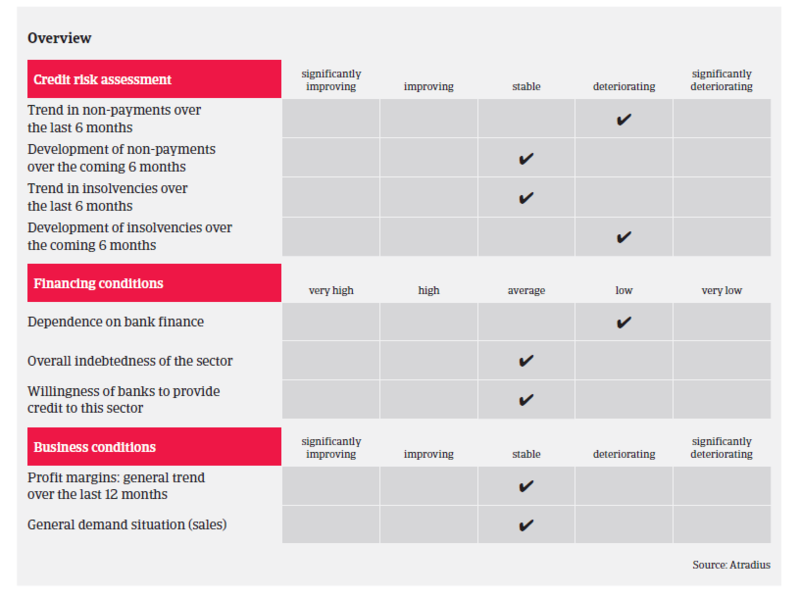 interim figures, cash budgets, overview of bank lines etc.) on each company we underwrite. Economic expansion remains broad-based, driven by private consumption and business investments, while export growth is sustained by the eurozone demand.